Glenn Compton is the Chairman of Manasota 88, a nonprofit environmental organization in SM.. Compton spoke to the Critical Times about phosphate mining activity locally, and what the repercussions of this activity will have on our environment. FL Gov. Ron DeSantis has called to remove the Common Core curriculum state-wide. 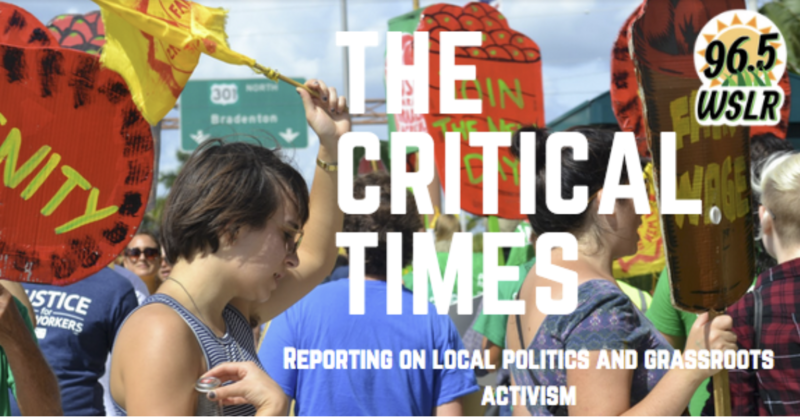 The Critical Times investigates how this state-wide measure affect the city of Sarasota. From Portland, OR to Newport, RI, there are hundreds of cities in this country that have banned plastic. And Sarasota could be next. Rethinking Plastic is an organization that seeks to eliminate single-use plastic in the area through education and policy change. Fracking will change the water system in Manatee county, WMNF reports on this crisis. In celebration of Black History Month, the Critical Times is speaking to different local organizations in the area to discuss how they plan to celebrate the history and legacy of African-Americans. This week, we speak to James B. Stewart, President of the Manasota branch of the Association for the Study of African-American Life and History, otherwise known as ASAALAH. All of this and more coming up soon!